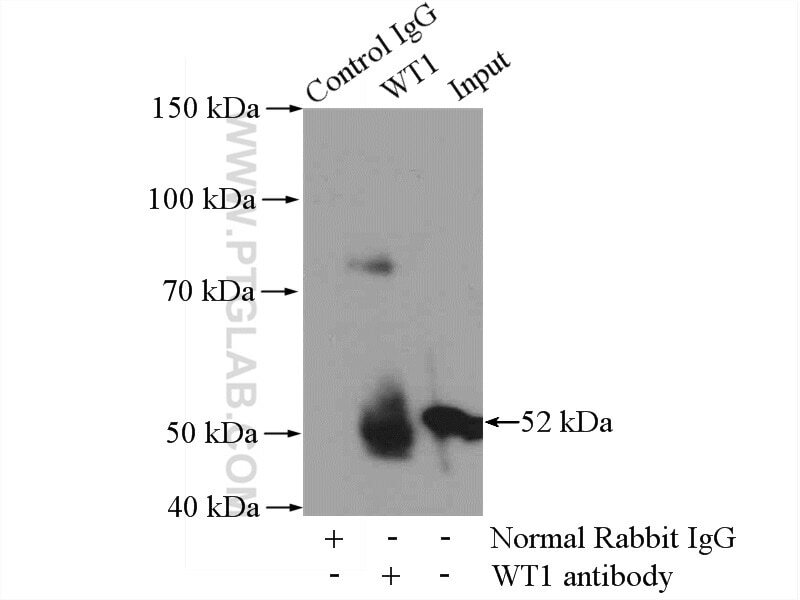 IP Result of anti-WT1 (IP:12609-1-AP, 4ug; Detection:12609-1-AP 1:1000) with mouse kidney tissue lysate 4000ug. The WT1 gene encodes a zinc finger DNA-binding protein that acts as a transcriptional activator or repressor depending on the cellular or chromosomal context, and it is required for normal formation of the genitourinary system and mesothelial tissues. WT1 inhibits apoptosis through p53 and Bcl-2 and also inhibits the differentiation of leukemic cells. Function of WT1 may be isoform-specific: isoforms lacking the KTS motif may act as transcription factors. Isoforms containing the KTS motif may bind mRNA and play a role in mRNA metabolism or splicing. Isoform 1 has lower affinity for DNA, and can bind RNA. WT1 exists some isoforms with the range of molecular weight is 33-50 kDa. Wilms' tumor 1 drives fibroproliferation and myofibroblast transformation in severe fibrotic lung disease. YAP induces high-grade serous carcinoma in fallopian tube secretory epithelial cells. Analysis of Circulating Tumor Cells in Ovarian Cancer and Their Clinical Value as a Biomarker.